If your little ones are anything like ours, they absolutely love fire trucks! Whenever the poppets see them on the street or hear them coming towards us, they get so excited - pointing at them and shouting “fire, fire, wee woo, wee woo!”. 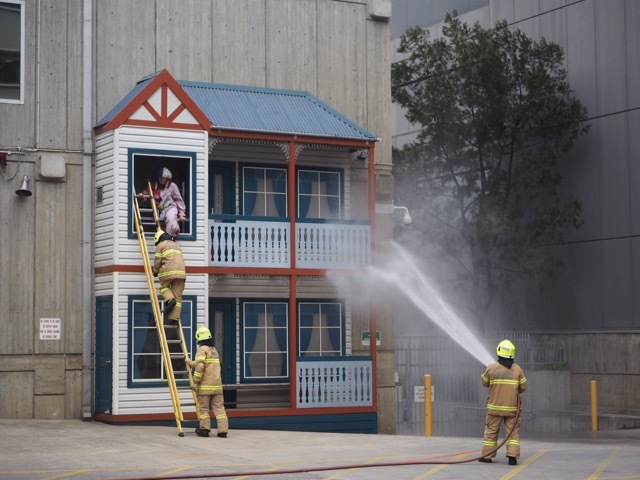 In what can only be described as one of Melbourne’s best kept secrets, each week the Melbourne Fire Brigade (MFB) hosts practical fire demonstrations for the public at several fire stations around Melbourne. These displays offer your mini firefighters the chance to not only watch a basic fire safety presentation and fire equipment demonstrations plus they even get to see fire trucks up close and meet real life firefighters. WOW! Last Friday morning, we headed down to the MFB Headquarters in East Melbourne to attend the Central District fire safety display at the Eastern Hill Fire Station. We entered the station via the tall glass roller doors, passing several fire trucks on our way through into the internal courtyard where the fire safety display was being held. Once in the courtyard we were greeted by fire fighters (who looked genuinely happy to welcome us into their workplace) and to our host for the morning. We were welcomed to the Eastern Hill Fire Station and given a short safety briefing in the event that the firefighters were called to duty, which can and did happen on our visit. Then we watched a rescue demonstration to show how specialist equipment helps to remove doors and windscreens off a car when a person is trapped inside. The poppets then participated in a tunnel crawl to demonstrate how to evacuate a smoke-filled room and watched a firefighter “stop, drop, cover and roll” if your clothes are on fire. It was great to see that all the little ones recognised the sound of the smoke alarm and the older children knew the phone number to call when you needed emergency help. Before we moved onto the practical, hands-on side of the display, we were introduced to a friendly firefighter who was dressed in his full uniform. Our ‘superhero’ went along the crowd giving high-fives to the children but unfortunately he was just a bit too scary for Arlo and Macy who preferred to hide under Grandma’s jacket instead. Much to the excitement of the children , we then got to see the team perform a rescue to help someone stuck on the first floor of a building that was on fire. Arlo and Macy loved watching the fire truck come into the courtyard with its lights flashing and siren ringing and of course watching the firefighter climb the big, tall ladder was pretty cool too. Then the real fun began! All the little ones were given the opportunity to dress up in a firefighter jacket and helmet. Despite the costumes being a little too big for my poppets, they both jumped right in and got kitted up quicker than they ever have for me at home! They then took turns in holding the heavy fire hose and extinguishing a fire cut out and of course all the little ones loved exploring the fire trucks up close and sitting in the seats. So much fun! A trip to your local fire station is a fun activity and even though Arlo and Macy were too young to comprehend the fire safety element, the biggest draw card for this activity for me is the opportunity for little ones to see a firefighter in their full gear. As per the poppets reaction, seeing a firefighter in their full gear can be quite scary so if we can show our children what a firefighter looks like fully dressed, it’s a great way to prepare if a fire or emergency ever happens in your home! Of course seeing the red-shiny fire trucks is pretty awesome too! > For more information on Weekly Fire Safety Display, head to their website. All demonstrations are free of charge however bookings are essential as numbers are limited. 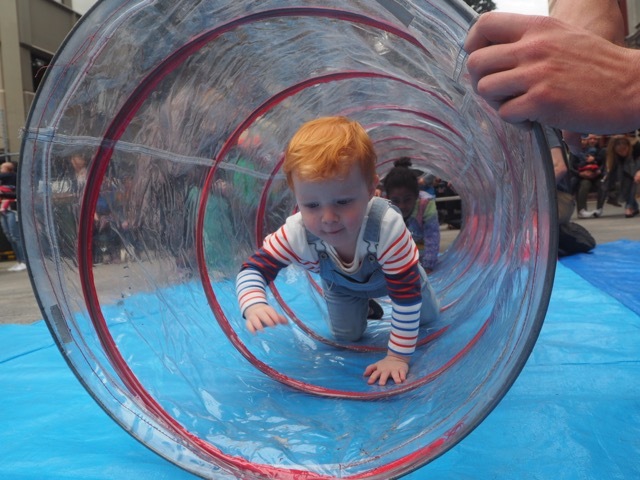 > For more ideas of what to do with your little ones, head to our daily spots list.